Hi folks, Doc here. The Meccano Construction system born in England in 1901 is arguably the most famous and popular metal construction toy system of all time. As such, it has been the model for many similar systems over the years. In America, A.C. Gilbert borrowed the concept of a standardised system of reusable metal parts, including perforated strips, girders, brackets, etc., for his own Erector sets. Elsewhere, other systems such as Marklin Metall in Germany and Ami-Lac in Italy were outright imitators. 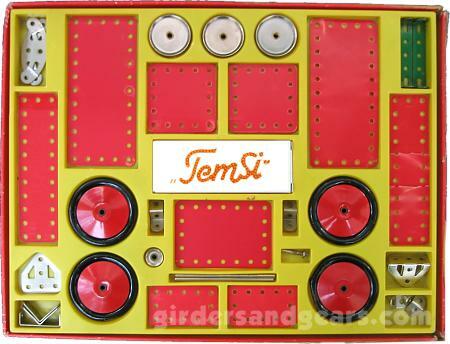 In post-WWII Europe, another such imitator appeared, this time in the Netherlands: Temsi. 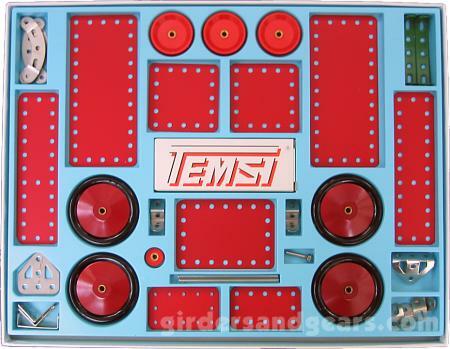 Temsi (an acronym for Technical Electric Metal Toy Industry) was basically a metric version of Meccano. The Temsi company was founded in 1946 by a local stamp manufacturer, Jan Blom, in the Dutch city of Hengelo. 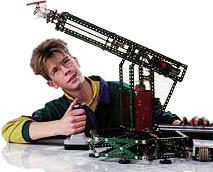 Blom apparently copied the Meccano system and then began producing his own sets, marketing them under the Temsi name. [He was able to do this, it seems, because of insufficient patent protection on the Meccano system at the time]. 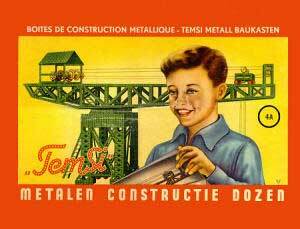 By the 1950s, Temsi had become a major name in the construction toy market in Europe, due in part to the scarcity of Meccano sets in European toy stores in the years immediately following WWII. However, a combination of rising manufacturing costs and declining interest in traditional construction toys in the 1980s forced the company to declare bankruptcy. Then, in 1987 Temsi was resurrected by a new owner, Jan Beldhuis, who moved the entire production to a new factory in Hengelo. By 1994, all sets had been redesigned with new artwork and packaging. 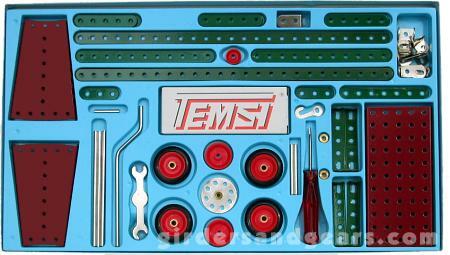 Thereafter, new Temsi construction sets were manufactured until 1999, when the production line was shut down for the last time. All remaining stock, along with manufacturing machinery, was sold to the German start-up Metallus, which is currently producing reproductions of Marklin Metal sets and spare parts. 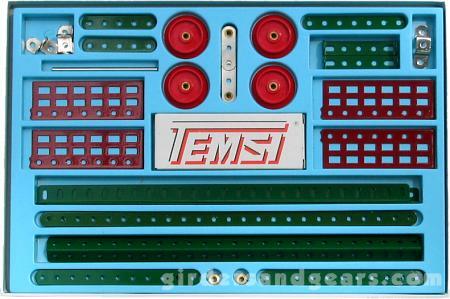 During the first few decades of production, Temsi sets were numbered from 0 to 4. By 1985, two additional sets - 00 and 5 - had been added to the line. In addition, a series of "conversion" sets were also available by then, numbered 0a through 4a. As their name suggests, each of these sets contained the parts necessary to convert one set into the next higher numbered set. For example, the set shown in detail later in this article, No. 4a, contained the parts needed to upgrade set No. 4 to set No. 5. Into the 1970s, Temsi boxes were red-orange in color (see photos above and below); lid labels typically featured the box art shown below above, an illustration of a boy with a green crane model on a bright yellow background. Instruction manual covers also featured the same artwork: early manuals had black and white covers, while later manuals had full color covers. The lid labels were later changed to a photograph of a boy bulding a model (or boy and girl - see image at the top of the page). Inside the box, the parts were arranged in yellow vacuformed plastic inserts inside a series stacking, removable cardboard trays (see photos above and below). By 1994, the artwork had changed to feature a photograph of several boys (or boys and a man) on a white background, and part inserts were changed to light blue plastic (see photo above). 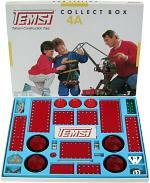 Like the early Meccano parts they imitated, Temsi strips and girders were painted green and plates were painted red. Brackets, curved strips, and trunnions were nickel plated. Gears, pinions, couplings and collars were machined from solid brass. Pulleys and sprockets were nickel plated steel, with brass bosses (hubs). The latter were double tapped (a great feature that I wish all manufacturers, both old and new, had used). Wheels were stamped metal, painted black. Red painted hub caps were riveted onto one side, a brass boss to the other. In later years, rubber tires were added. 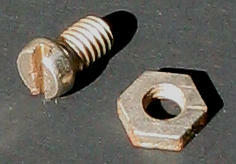 Screws came in various lengths, and had flat-topped slotted round heads; nuts were haxagonal, fairly wide, and flat on both the top and bottom (see photo). In another nod to Meccano, later sets included flexible red plastic plates in a variety of sizes (see below). 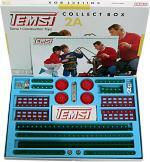 Although Temsi basically duplicated Meccano, there were some interesting differences between the two systems. Temsi strips and girders were slightly longer and thicker than their Meccano counterparts, and (oddly) the hole spacing was slightly wider: 12.73 mm vs 12.7 mm. While this difference may seem insignificant, it meant that there could be problems when mixing parts from both systems in the same model, at least on long or tall structures. Various motors were available for Temsi sets, although they were typically sold as spare parts or in add-on accessory kits. One of these motors is shown in the photos below. 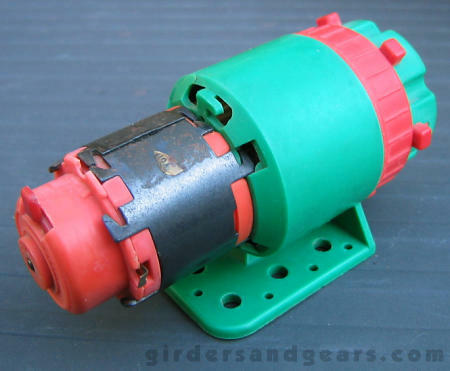 This particular motor was a later model, made in Germany for Temsi by the same company that made the Meccano PDU motor (the two are very similar). It has a plastic housing with an integrated mounting base. It is battery powered like other Temsi motors, and was designed to run on 3-12 volts. 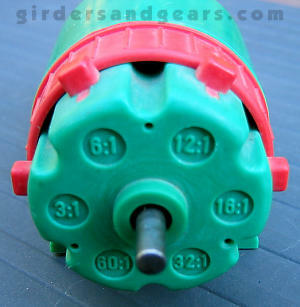 It incorporates some very special features, including a foward-reverse switch with a center-off position, and a very clever integrated gearbox with six different gear ratios that can be changed by simply rotating a dial on the front of the motor to the desired ratio, and then sliding in a plastic tab to engage the gearing. This is as slick an arrangement as I have ever seen! In addition, transformers like the shown at the upper left were available to control the motors. Shown below are diagtams of the different part types; note that for certain parts (e.g. perforated strips, angle girders, etc. ), only one size is shown. The regular Temsi line included eleven sets in all, six regular (or "standard") sets numbered 0-5 and five supplemental sets numbered 0a-4a. As in other systems, when a supplemental set was combined with the standard set of the same number, the result was the equivalent of the next largest standard set. For example, combining set No. 4 with set No. 4a produced the equivalent of a No. 5 set. Pictured below is the 1990s version of the No. 2 "Standard Box" set. The single aqua blue vacuformed plastic tray holds a total of 139 parts, including a large flanged plate, two sector plates, a variety of perforated strips, red plastic pulleys/wheels with black rubber tires, a pierced disk, and a miscellaneous assortment of other parts and fasteners. A monochrome instruction manual with a glossy full color cover is included. Pictured below is the 1990s version of the No. 2a "Collect Box" supplemental set. 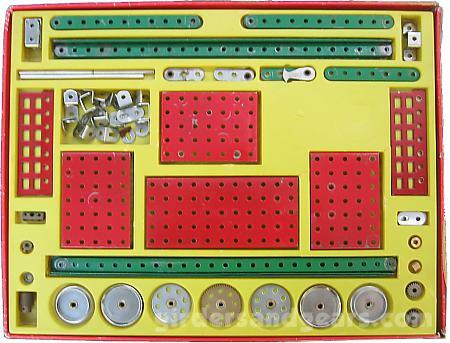 The single aqua blue vacuformed plastic tray holds a total of 101 parts, including angle girders, a variety of perforated strips, four red plastic flanged wheels with brass bosses, four windmill blades, long double angles, eccentric cranks, and a miscellaneous assortment of small parts and fasteners. A monochrome instruction manual with a glossy full color cover is included. Pictured below is the 1990s version of the No. 4a "Collect Box" supplemental set. The single aqua blue vacuformed plastic tray holds a total of 100 parts. In addition to trunnions, curved strips, pulleys, and other small parts, the main features of this set are the large, pressed metal wheels (painted black) with riveted-on hubcaps (painted red), and an assortment of flexible, red plastic plates of various sizes. A monochrome instruction manual with a glossy full color cover is included. 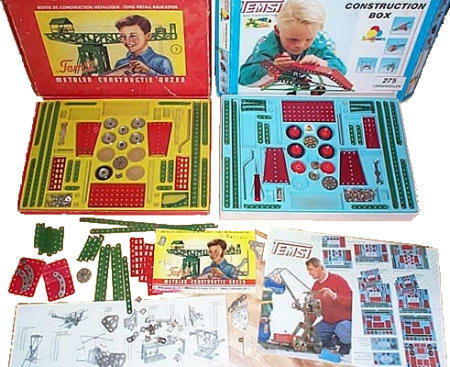 Also shown below is the 1960s version of the same set. Note that it is virtually identical in both content and layout. Thr primary difference - not including the graphics and color of the packaging - is with the materials of selected parts. 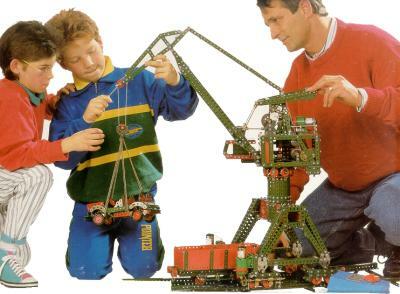 As the photos on this page show, the pulleys in the later version of the sets are made from red plastic wil brass bosses, while those in the earlier sets were nickel plated steel, also with brass bosses. In addition, the flexible plates in the older sets were made from much thicker (and less pliable) plastic than their counterparts in the later sets. With 468 parts arranged in three separate stacked trays, the No. 5 was the largest set in the Temsi line. Two of the three trays are shown on this page, including the tray that is also the No. 4a set, as well as the one shown below. The set includes all of the parts shown in the photos above on this page, as well as a variety of flanged plates, pierced disks, couplings, and gears. The latter, all machined from solid brass, include a worm, a large sprocket, and two sizes of pinions. Among a small handful of accessory sets that were offered through the years, perhaps the best and most useful one was the Chain Box set, shown below. The key feature of the set was the variety of different sizes of coarse toothed sprockets that were cut to mesh with the included brass ladder chain. When coupled with one of the stronger Temsi motors (sold in separate accessory kits), these parts could be used to efficiently drive some of the largest mechanized models.